When it comes to sentimentality in theatre it is easy to be torn. Do you go with it, even if it is overly-exposed, and let yourself get caught up in the fervor of it, likely leading to that emotional pay-off you were probably seeking with a night at the theatre? Or, do you approach it with cynicism, laughing in its face, as nothing more than a cheap parlor trick bestowed upon you by the playwright to try and make you think what you are seeing is somewhat profound, when actually, it’s not? 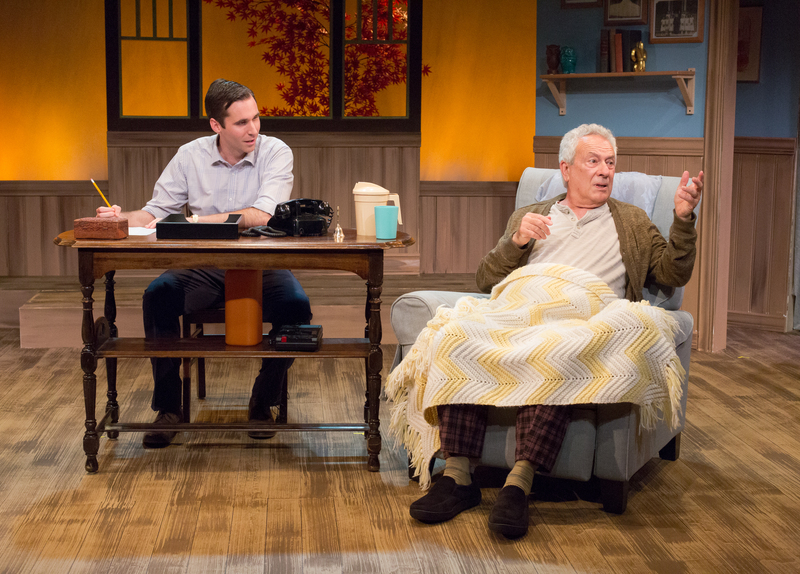 With Tuesdays with Morrie, now playing at Act II Playhouse in Ambler, the recommendation is to understand the latter is true, but quickly accept it and embrace the former. If you do, you’ll thoroughly appreciate your choice of entertainment for a summer evening. The play, written by Jeffrey Hatcher and Mitch Albom, who also happens to be one of the two characters in the play, is based on Albom’s Pulitzer-Prize winning book of the same title that examines a real-life relationship between Albom, a noted sports writer, and Morrie Schwartz, a college professor of his at Brandeis University with whom he had a relationship, ignored for the better part of two decades, and only rekindled their friendship years later when he found out Schwartz was dying of amyotrophic lateral sclerosis (ALS), better known as Lou Gehrig’s Disease, is an amalgam of such sentimentality. Schwartz is written in such a way that there is no way the audience doesn’t fall in love with him. He is a wise old owl, prone to speaking metaphorically to teach life lessons, who, as his health deteriorates, uses gallows humor to relieve any tension and to prevent you from feeling sorry for his situation. Meanwhile Albom is a self-absorbed narcissist who, although he allegedly has a life-changing realization spending time with Schwartz in his final months, really doesn’t have that cathartic moment because he turns his visits with Schwartz into a job – recording and interviewing Schwartz on every visit, with the full intention of exploiting his former professor’s death for his own benefit- writing a book, knowing he can play a fine tune on the heart strings of the reading public. However, the real beauty of this play is in Schwartz’s ability to cut through that self-important veneer of Albom’s to actually earn a moment of true emotion at the play’s climax. It’s a moment that is sure to move you to tears – as it did for me. That is a credit to the fine performances of Philadelphia acting veteran Tom Teti as Morrie and Sean Close as Albom. Both were sensational. Let’s start with Close. As a sports writer myself, I’ve had an opportunity to work with Albom. I’ve been around him. I’ve watched him many times on television. I have a feel for his personality. I know how he presents himself. Apparently, Close has done plenty of research, because he nailed Albom to a tee. It’s not every day you see a character based on an actual person portrayed by an actor on stage with precision. It’s often either a caricature of the person or a completely different interpretation of the character. Not here, Close was Albom. From his vocal pattern, to the way he expressed his stress level when being pulled in several different directions by work and Schwartz at the same time. Close nailed it. Nailed it. Sorry for the repetition, but it was THAT accurate. Meanwhile, Teti was a gem. To steal a portion of a line from the movie Jerry Maguire, he had me at hello. He comes on stage dancing. He does three or four different dance routines with a joie de vivre – which is a great foreshadowing of his character. Teti was superb. He performance was rich. He was at times grandfatherly, at times professorial, at times Water Mitty-ish, at times Henny Youngman. And although on the night I attended he had one moment early in the show where he blanked on a line and needed Close to save him, that one glitch was quickly forgotten because of his bevy of brilliant moments. His deterioration from dancing guru to his death bed was sad, but amazingly performed. His moment with the egg salad (when you go see it, you’ll know what I mean) was when he first got me, so the rest of the way, I was in Teti’s capable hands. Close and Tetti played off each other perfectly, which is a testament to the fine direction by Matt Silva, who has directed several shows previously at Act II Playhouse. I am impressed by directors who really find subtle moments in the script and find ways to highlight them, and Silva did that in spades with this production. Dirk Durossette’s scenic design was nice and intimate, highlighting the comfort of a suburban Massachusetts home. It was augmented perfectly by Jim Leitner’s lighting design that turned it from a vibrant, stylish home in the 1970s to a stale yet still comfortable home in the 1990s – one that never changed from it’s original design, but still had its own character. Jillian Keys’ costume design was time-appropriate and fine and John Stovicek did strong work with the sound design, although a blown speaker, with an incessant buzz put a little bit of a damper on the climax of the show. Act II Playhouse is a small house, and their tickets sell fast, but if you can get your hands on some for this show before it’s gone at the end of the month, get them. I promise you, Morrie will make good on a promise that he offers early in the show – before it’s over, he will make you cry. Tickets for Tuesdays with Morrie at Act II Playhouse are $29-$42. Tickets are available online at http://www.act2.org, by calling the Act II box office at (215) 654-0200, or in person at 56 E. Butler Ave. in Ambler.